Metro Siding serves the greater Twin Cities of Minneapolis-St. Paul. To schedule a estimate for new or replacement railings, just call 763-557-1808, or contact us. 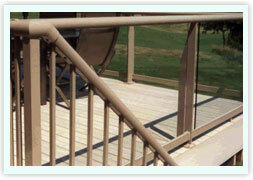 Metro Siding installs quality glass and aluminum deck, balcony or porch railings from Deck Images. These premium-grade, powder coated, architectural grade components are built in the USA. Glass Panel Railings provide openness, safety and design flexibility. Deck Images glass and aluminum railings will never rust or need painting and have a 25-year limited warranty. The powder coated glass and aluminum deck railings come in two top rail profiles and seven different colors. Choose from 1/4 inch or 3/8 inch tempered glass. Glass rail systems are elegant and complement a variety of architectural styles. Aluminum Picket Railings offer a more traditional look, but are still maintenance-free. 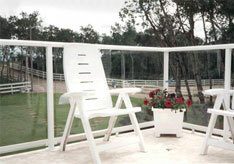 Deck Images aluminum picket railings also have a 25-year limited warranty. Choose from a round or square profile, and seven different colors. Aluminum picket railings are commonly used for stairways, balconies, and pool areas. 3-year warranty on labor. 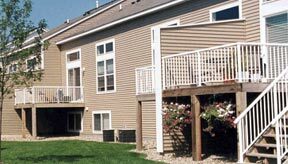 Our railing installation crews are some of the best in the Twin Cities. So good, in fact, that we guarantee workmanship for 3 years. Neat and Careful. Our expert crews take care to protect plants and landscaping during installation and clean up the site at the end of every day. Fast Installation. An average project can be done in less than a day. A dedicated service representative is available to answer your questions, before, during and after installation. We install new and replacement railings. For quality products, great service, and expert installation, call us today!